Bay laurels (Laurus nobilis), also called sweet bays, bear the kind of bay leaves used in cooking. The evergreen trees or shrubs can be grown outdoors year-round in U.S. Department of Agriculture plant hardiness zones 8 through 11 and also make good houseplants when kept trimmed to a small size. Bay laurels' messiness may depend on their gender. Bay laurels are dioecious, which means some bear male flowers and others bear female flowers. The flowers, which appear from March through May, are fragrant, inconspicuous and yellow-green. Only the female plants produce berries, and they do so only after they are pollinated by male plants. Bay laurels are not notably messy; they don’t drop their leaves in fall like deciduous plants. Female bay laurels that have fruited, however, drop their blue-black berries, which could stain driveways and sidewalks or otherwise create a mess. Laurels are tough, drought-tolerant plants. They thrive in rich, regularly moist soil but can take neglect after they become established in their location. Bay laurels do best in full sun or partial shade. In their native, southern Mediterranean habitat, bay laurel trees reach 60 feet tall. Elsewhere, they top out at 30 to 35 feet. The plants usually are kept much smaller with regular pruning. They grow well in containers, often paired and pruned as standards. 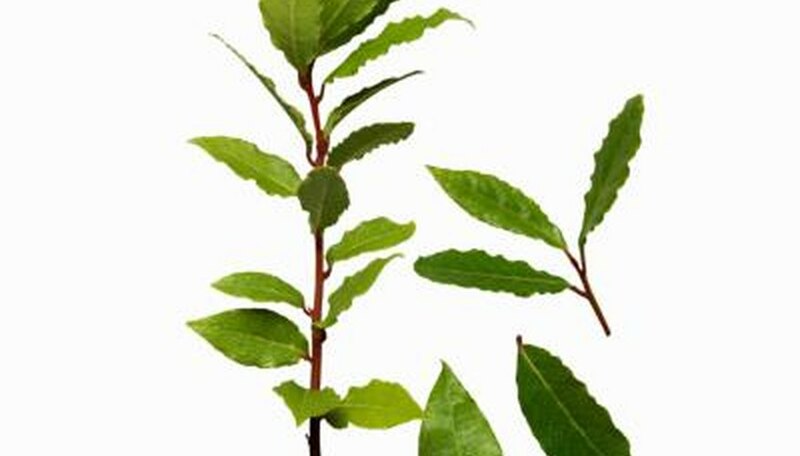 If you wish to use leaves from your bay laurel plants in cooking, then choose older, rather than new, leaves, pick them in morning and allow them to dry. Weight them so they won’t curl as they dry. Because the edges of the glossy, leathery leaves are sharp and can cut your mouth, don’t try to chew whole leaves or pieces of the leaves. Use the leaves whole in cooking, however, so you can remove them easily before serving the dish they flavored. Bay leaves are used in soups, stews, brines, sauces and marinades, particularly in Italian, Spanish and Creole recipes. They are one of three ingredients, with parsley and thyme, in the French bouquet garni. Ancient Greeks and Romans fashioned bay laurel leaves into a crown, or laurel, to be worn by winners of sporting events. In Greek mythology, the river god Peneus turned his daughter, Daphne, into a bay laurel tree so she could avoid the amorous advances of the god Apollo. Apollo then donned a wreath of laurel leaves to show his undying love.